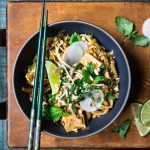 This vegan twist on pad thai is a satisfying, flavorful dinner for any time of year, but we especially love making a big batch on a cold winter night! It’s quick and east, and it’s even better as leftovers the next day. Optional: for non-vegan version, add in 1 lb. shredded chicken breast or 1 lb. cooked shrimp and 3 eggs, scrambled. Add rice noodles to a large bowl and cover with very hot water. Let sit until al dente, then drain and rinse in cold water. Set aside. Heat oil in large pot over medium heat. Add green onion and garlic and sauté, stirring frequently, for about 5 minutes. Add mushrooms and carrots and continue to cook until vegetables are softened. Add tofu, 1/4 cup of low sodium tamari, 2 tblsp lime juice, coriander, red pepper flakes, sugar, sriracha, peanut butter, cilantro and basil. Stir well to combine all ingredients and continue cooking for a few minutes, until tamari reduces. Turn heat to low. Add in cooked rice noodles, rest of tamari and lime juice, chopped peanuts, spinach (if using) and bean sprouts. Use tongs to coat noodles well. Let sit for 15 minutes, stirring frequently, until noodles are fully cooked. Taste and add more lime and/or tamari if needed. You can also add more sriracha or red pepper flakes if you like it extra spicy. Top with more chopped peanuts, cilantro & basil, radish and more sprouts. Enjoy hot (but it’s also great straight from the fridge the next day!). -If we are adding meat or shrimp for the rest of the family, we typically divide all ingredients in half and cook in two smaller pots. **Make sure you are using low sodium Tamari or soy sauce. If not, use less, taste and adjust.